As the 56" Macomber is every bit of a Beast, the 36" Leclerc I am bringing back to life has been named Belle. In line with that theme, the Glimakra warping mill now sports the moniker Babette, although she is a lot more than a feather duster. The first round of Belle's rehabilitation included a thorough cleaning, new brackets on the sectional warp beam, a new apron on the cloth beam, and replacement of the brake circle, brake cord, treadle hooks/cords, and all of the plastic pieces, including shaft slide guides, jack lifts, and brake locking catch. This model is older and did not come with a nylon pulley to assist the brake cord, so we added one of those. There were a few other things, as well, they are just not springing to mind. She was also outfitted with two new reeds, 10 and 12 dent. Despite a Naval Jelly soak and a good bit of sanding, the surface rust held fast, and I felt the need to replace the original 12-dent reed. The old one has been gifted to a lady trying to restore a Harrisville 36" loom. As soon as I put the maiden warp on her, the ratchet pawl for the take up motion handle to advance the cloth beam broke into three pieces. 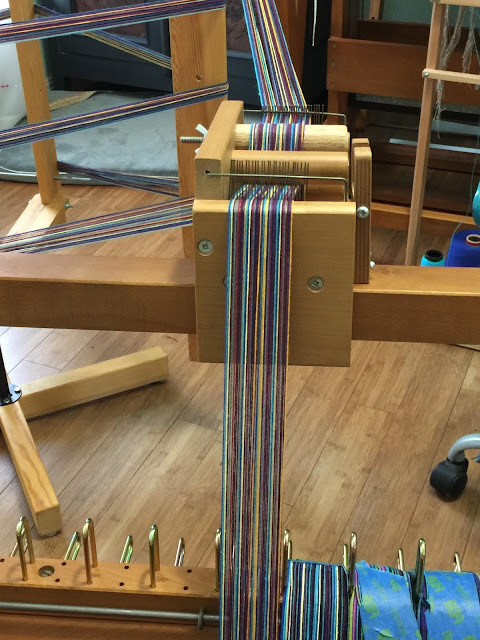 Thus, the second round included that piece, as well as new heddle support rods and all new heddles. With the help of the very handsome and handy husband, the stinky shaft issues were addressed, and I am very pleased to report that 8 or 9 quick spray coats of polyurethane has resolved the odor problem! The bonus is that the wood on the shafts have deepened in color, too. 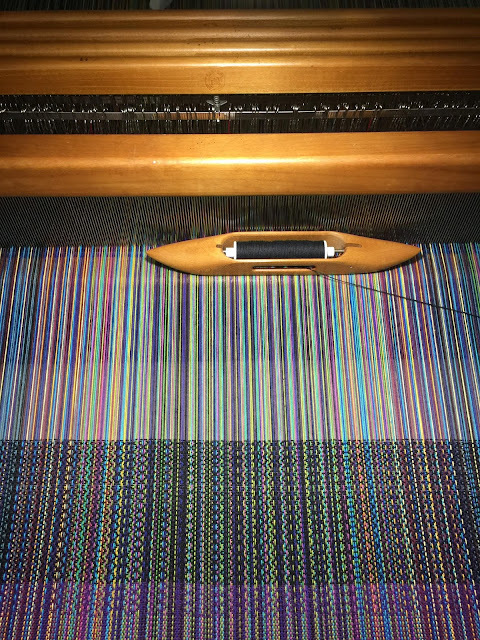 Once the ratchet pawl was replaced, and I was able to advance the cloth to weave, I began weaving in earnest; however, the brake kept slipping and I could not maintain a high tension on the warp. This was upsetting, as I like a lot of tension, at least on my looms. There is only so much that one can adjust with the Leclerc tension brake systems. 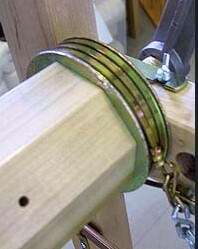 The brake circle and spring are attached to a lever with S-hooks. I tried increasing the tension by omitting the S-hooks and attaching the spring and/or the brake circle directly to the lever. That helped, but it still slipped. The brake circle was obviously new. In the directions, which came with it, it advised not to unwind the brake circle. 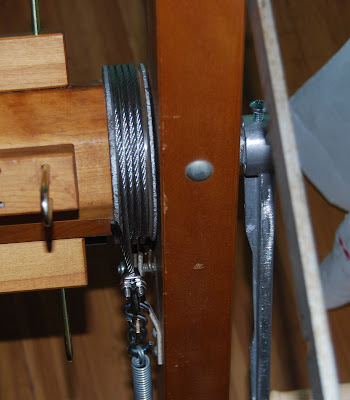 I didn't; however, I do admit when I tried to put it on the warp beam and attach it to the loom, I thought I had secured the brake circle end first, before I attempted to attach the other end (all by myself), the brake circle end came undone and may have stretched out the coil. My mistake, as the back beam is rather heavy, and it would have been much better to have waited and requested assistance before launching into it alone. To be honest, I was peeved. Looking at the tension brake on the Macomber to compare, it used a cable, rather than a flat brake circle. Before I ordered another brake circle, I asked the husband, if he would be willing to make me a cable brake. He agreed, but he did not know when he could get to it. Moreover, it works BEAUTIFULLY with no slippage! YAY! It begs the question, of course, why Leclerc chooses to continue to use a finicky brake circle, instead of a cable, but as long as Belle works to my satisfaction, I am letting that go. 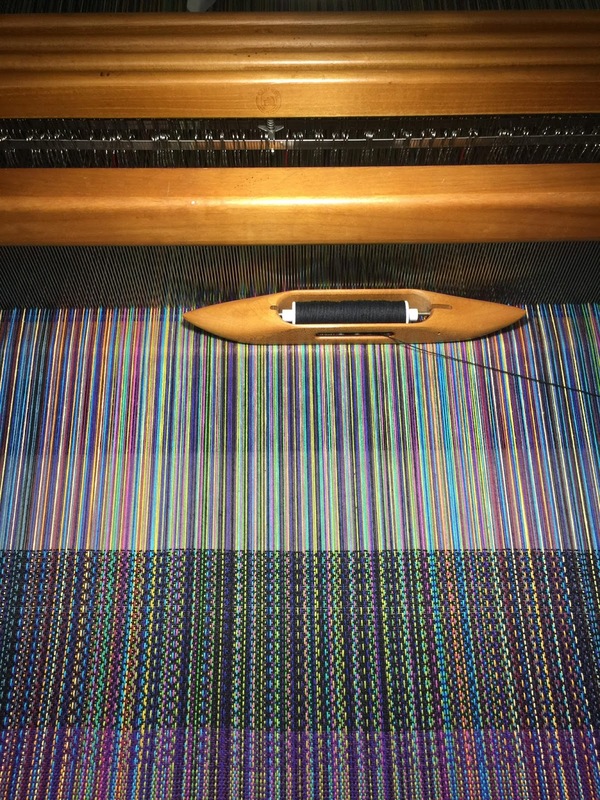 Notwithstanding the slipping of the brake with that first warp, I was able to pull off some nice cloth. The warp was 8/2 cotton. 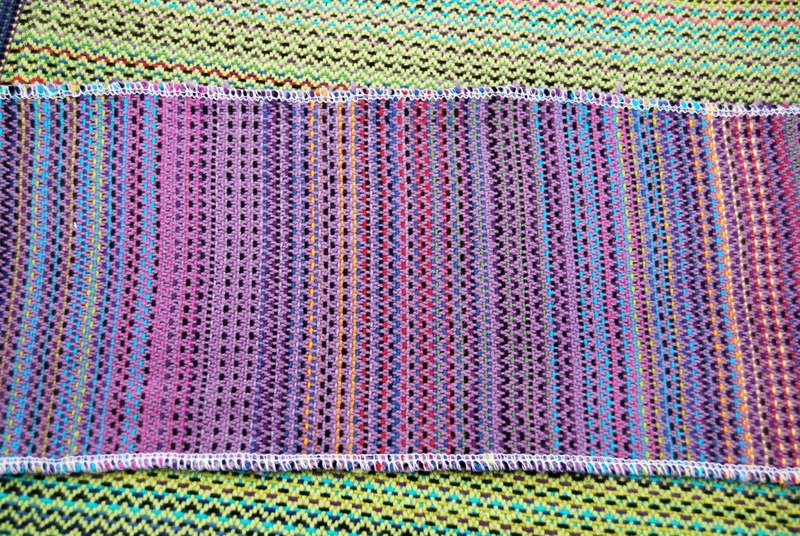 With the weft, I played with 8/2 cotton, as well as some 8/4 Maysville cotton rug warp I had left over from previous projects. My sett was 20. In the foreground, I used purple 8/2 cotton weft in a zig-zag twill pattern. 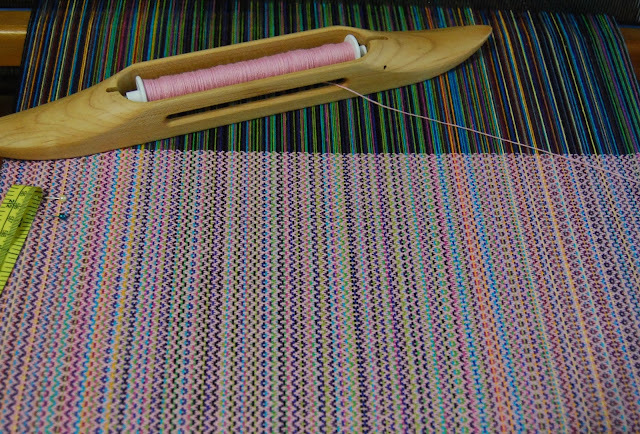 The background hosts the same twill (turned at a 90-degree angle) in 8/4 cotton used in the weft. Both are wonderfully soft with a lovely texture. 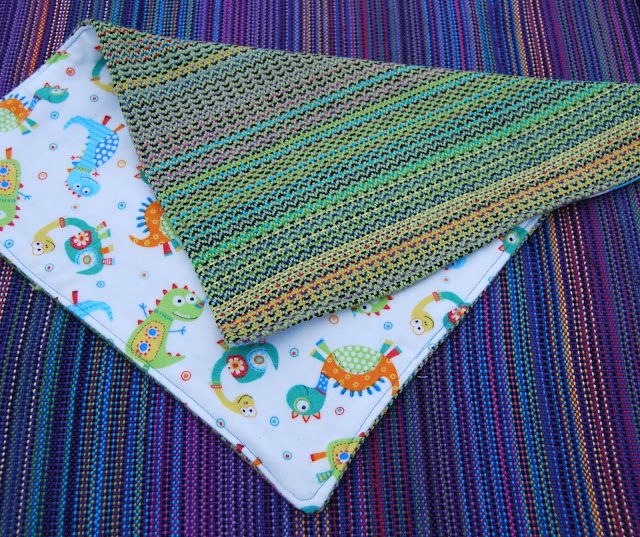 The 8/2 warp and weft combination will be perfect for baby wraps. 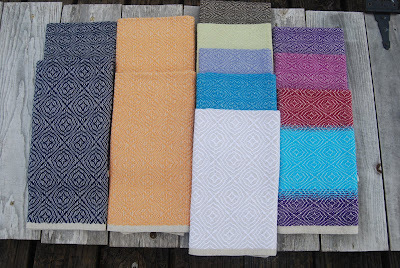 The 8/2 warp with 8/4 weft is heavier and will make fantastic towels. As this was a sampling trial to get Belle going, I had no real plan for this fabric, other than dish towels, at the very least; however, a good friend of mine mentioned friends of hers were going to be grandparents for the very first time and burp towels would make a nice gift for them, especially handwoven ones. From the time the first warp went on Belle until the second, I acquired a tension box. The only reason I bought it was because Belle had a sectional beam, something I had never even considered. 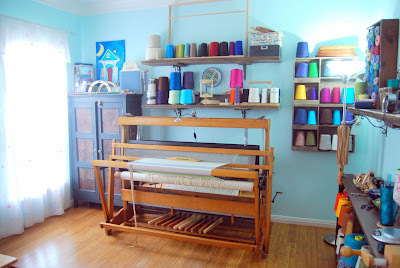 While I did not have a spool rack, the first spool, or a spool winder, I devised a way to use the tension box by using the warping mill to prepare 40 ends at a time and pull them through the tension box and wind them onto the back beam. It was not the most efficient way to do it, but Handywoman has agreed (Bless her!) 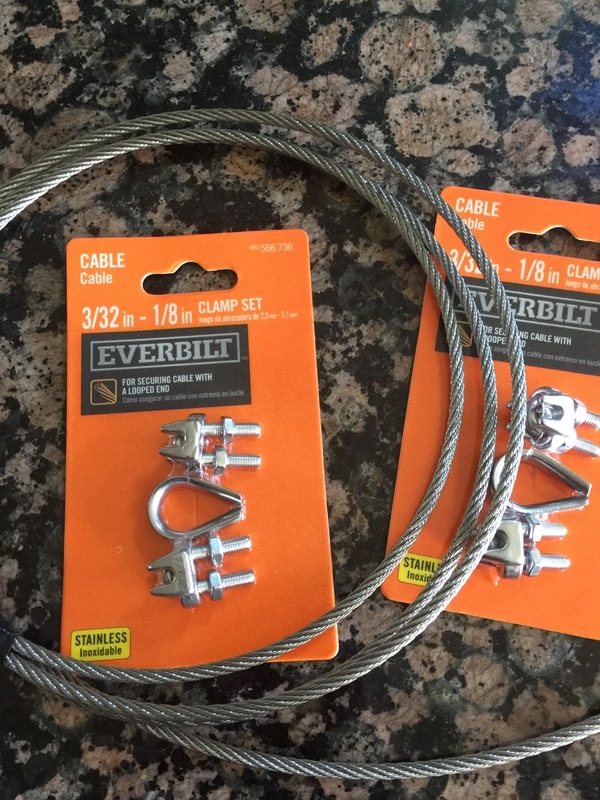 to make me a custom spool rack, and I will be able to do it properly very soon! Two of my dear friends are expecting little bundles of joy, one in late September and the other in late December. This warp was supposed to make two baby wraps, one for each of them, but my desire to make them "perfect" is causing a bit of crisis of confidence. I love plain even weave. 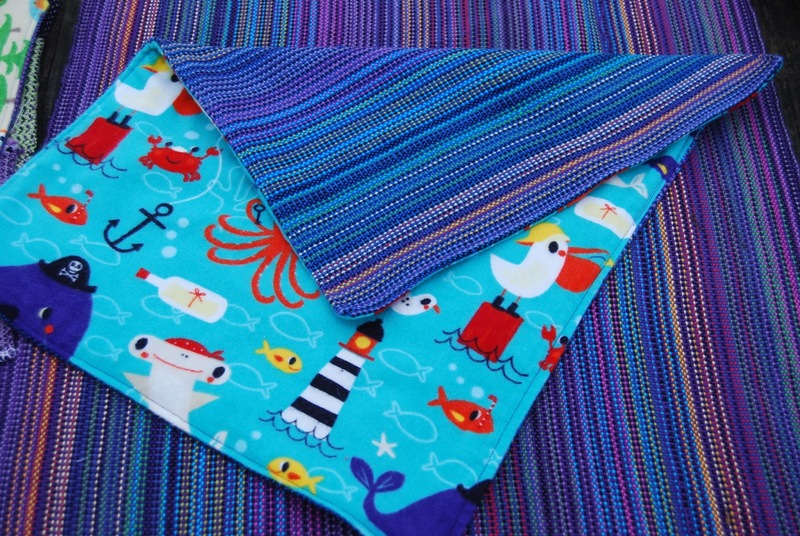 It is durable, attractive, and makes a lovely fabric, but I wanted to do something a bit more special. 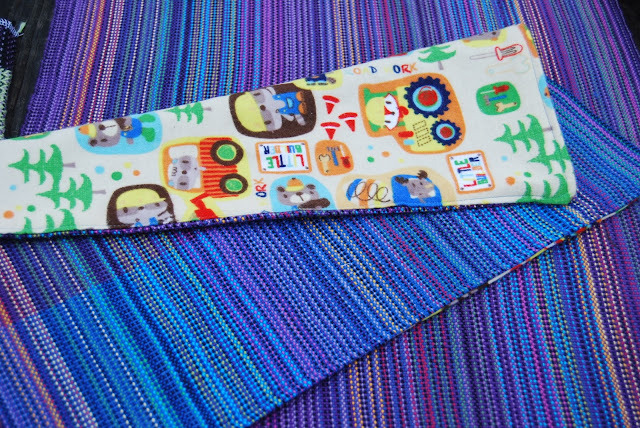 The lighter weft colors show off the pattern better, but they also mute the color of the warp. In all, I am delighted with the Leclerc Nilus! She is a perfect companion to the Macomber. I just need more hours in the day or to win the Lotto and get that day job thing out of the way. Lol.